Hi Friends! Welcome back to the HGG Blog! If you’re like me, you love snacks! 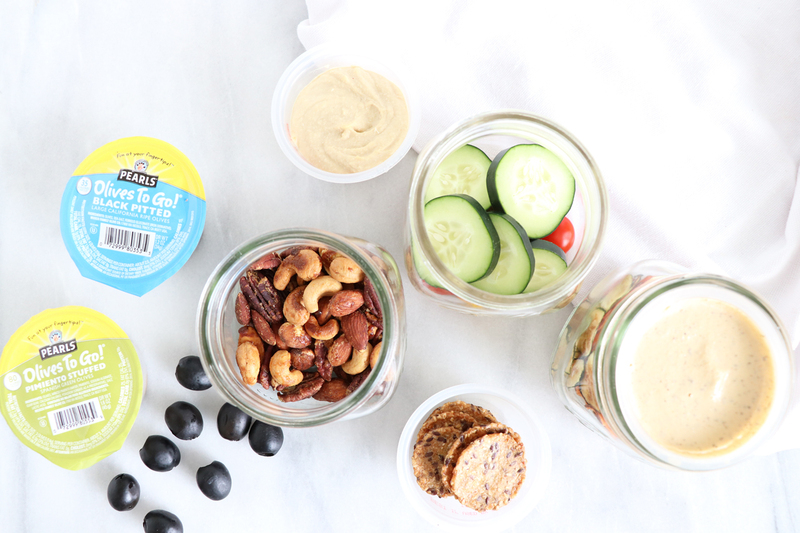 Today I’m sharing 3 Savory Snack ideas featuring Pearls Olives To Go! Snacks are a great way to help manage appetite and energy levels! Extreme hunger can lead to extreme overeating at your next meal. To avoid this, I recommend being prepared with quality & wholesome, real food snacks. One of my favorite tools for meal prep is to use Mason Jars! They are reusable and I love that you can see through them making it easy to know exactly what you have on hand in the fridge. I am a big fan of olives. I eat them almost every single day! Like all our HGG recipes, please feel free to adjust ingredients and quantities so that work for you! Next, place nuts in a bowl and drizzle with maple syrup, and then stir together so the nuts are evenly coated. Add in ginger, curry power and sea salt. Spread nuts evenly on baking sheet and bake for 12-15 minutes until nuts are toasted and sugar is browned. Give nuts a stir halfway through so they cook evenly on both sides and do not burn. Let nuts cool for a few minutes then add mixed nuts to a mason jar. In one empty Pearls Olive To Go container add crackers. Add slices of cucumber and cherry tomatoes into a mason jar. In one empty Pearls Olive To Go container add hummus. Use the metal ring to secure the hummus into the container & secure the Pearls Olives To Go with your favorite olives to the top! Place slices between paper towels and roll over the top with a rolling pin to remove excess water. Place slices on a baking sheet & cook in the oven for one hour at 225 degrees Fahrenheit. Optional: Drizzle with a little coconut oil & sea salt for even more flavor before cooking in the oven! To make ranch dip, drain and rinse soaked cashews, add into a high speed blender with all remaining ingredients and blend! Add veggie chips to mason jar. In one empty Pearls Olive To Go container add ranch dip. Use the metal ring to secure the ranch dip into the container & secure the Pearls Olives To Go with your favorite olives to the top! What I love about Pearls Olives To Go is that they are incredibly convenient, easy to open and portion controlled. They are perfect to grab and go, or add to a grab and go snack like I shared today! Olives are a wholesome, delicious choice and contain monounsaturated fats, which can help you feel full & satisfied! If you find yourself not feeling “full” when eating plant-based meals or snacks… make sure that your dish has some healthy fats, like olives! For a money saving coupon make sure to visit the Pearls website here! Disclosure: Today’s video & post is possible thanks to our sponsor, Pearls Olives To Go.